The 2014/2015 JAMB Direct entry is now on sale. Applications are invited from candidates with HND, ND, NCE, IJMB, Cambridge A level, BSc, HND, ICAN into 200 Level in Nigeria universities. If you have any of the above certificate or awaiting result in any of them, you are eligible to apply for direct entry in any Nigerian universities. Some Universities also accept own diploma or diploma from recognized institutions in Nigeria. 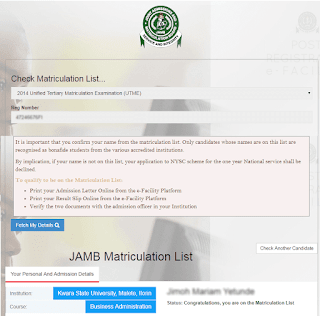 It is worthy of note that it’s now a compulsory requirement for candidates seeking direct-entry admission into any Nigerian university to register with the Joint Admission and Matriculation Board (JAMB) before any admission offered could be deemed authentic. SCAN AND SEND TO YOUR EMAIL ADDRESS, OR THE PIN AND S/N TEXT TO YOUR PHONE NUMBER. Hw much do u process post ume for delsu? Does delsu accept lower in ND result into direct entry and how much is it? Does uniben accept lower credit in ND result into direct entry and hw much is it ?